That There Is A Lot Of Piranhas! A New York City man is accused of smuggling nearly 40,000 piranhas into the U.S. by having them mislabeled as harmless aquarium fish, prosecutors said. 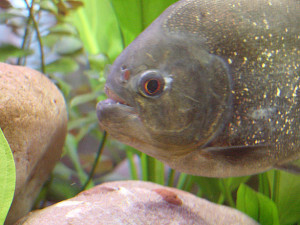 [Joel Rakower] began importing the mislabeled fish in 2011, shortly after New York City prohibited possession of piranhas, and continued through 2012, prosecutors said. In all, he smuggled 39,548 piranhas, worth $37,376, that were then sold to fish retailers throughout the U.S. So a piranha is worth less than $1? Go figure. Joel Rakower and his fish distribution company pleaded guilty Wednesday and agreed to pay more than $70,000 in fines and restitution. Authorities said Rakower admitted buying the aggressive fish from a Hong Kong supplier that he instructed to falsely label the shipments as silver tetras, a more common household fish. Twenty-five states either ban or regulate piranhas, which could pose a serious risk to ecosystems if they got into native waters. What about the serious risk to swimmers? Or has The Juice seen too many movies with piranha scenes? Anyway, you’ll find the source here.